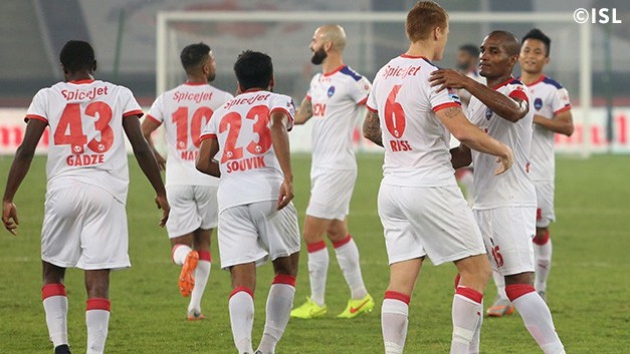 Delhi Dynamos FC brushed aside FC Pune City in their Hero Indian Super League Season 2 match at the Jawaharlal Nehru Stadium in New Delhi on Thursday evening. 14,299 spectators were witness to a brilliant display by the Lions who cruised to a 3-1 win over the Stallions courtesy of first-half strikes from Adil Nabi and Anas Edathodika and a second half penalty from John Arne Riise after Govin Singh had received his marching orders from the referee. Adrian Mutu scored a late consolation goal for FC Pune City. It didn’t take long for the game to get going. The Dynamos had the first shot of the game within 30 seconds through Nabi who forced keeper Arindam Bhattacharya into conceding the first corner of the match.